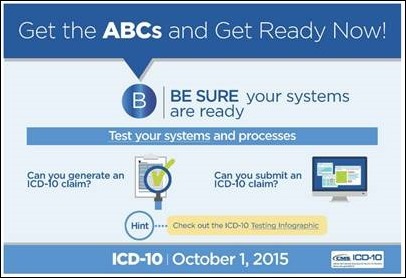 CMS is pushing their “ABCs of ICD-10.” Although this week’s focus is on “B,” I hadn’t seen the campaign before. As a physician, I couldn’t help but think of the fact that when we hear “ABCs” we immediately tend to think “Airway, Breathing, and Circulation” as we’re trying to resuscitate patients. Based on some of what I’m seeing in the community, I think we’re going to be resuscitating more than a few providers and billing supervisors as their practices are decidedly not ready for the transition. I was on the phone with a client today who has decided not to take its vendor’s mandatory ICD-10 patch and instead will try to customize the system on their own. They plan some brute force workarounds if that doesn’t work. At this point in the game, I just don’t have the stomach for working with people in that mindset. I told them that if they agree to take their vendor’s patch I’ll be happy to assist, but if not, they’re on their own. It’s just too risky when there are fewer than 30 days on the clock and there are tested solutions available. Interestingly, the “B” campaign stands for “Be sure your systems are ready.” They recommend practices test to make sure they can generate and submit claims, schedule appointments and procedures, verify eligibility and benefits, submit quality data, update patient histories and encounters, and code encounters. If you’re just thinking about testing these items now, you have a lot of work in front of you. Speaking of the October 1 date, I’ve seen an uptick in requests for last-minute locum tenens placements spanning the go-live date. I am not sure if people are thinking the system will grind to a halt and want to staff up or if small practice providers are deciding to take vacation during the transition and return to practice when things are stable. I see more specific EHR information in the listings than I have seen in the past. I had to laugh though at one of them, which was not only trying to recruit a “Physican,” but also said the small-town practice includes “tell a med.” I can only infer that telemedicine is involved, but there were enough problems with the listing to make me worry about what one might be walking into (including spelling the name of the EHR wrong and failing to capitalize “September.”) The one site only sees 6-10 patients a day and that’s certainly tempting, but I doubt the locum agency’s ability to handle professional liability coverage and credentialing when they can’t spell. My former hospital made me chuckle today by announcing (at 11:30 a.m.) that they would be taking the hospital system down from noon to five for a scheduled upgrade. Seriously, who performs upgrades in the middle of the work day? They’re offering a special support line from 5-7 p.m. then going back to regular support hours. I suppose they assume all bugs will present themselves in the first two hours after the upgrade. There was no mention of what the upgrades would bring or how users should anticipate their workflows might change. Needless to say, I’m feeling pretty good about having jumped ship when I did. I just hope they keep me on the distribution list because it’s been amusing. I’m always happy to feature companies that are giving back to the community. While the Epic User Group Meeting is in full swing, Nordic Consulting is partnering with local organizations to make the world a better place. 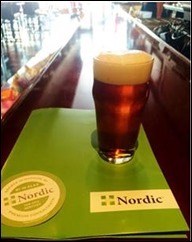 Monday night at their open house, Nordic served a custom-brewed Nordic EHR IPA. For every pint poured, they donated $1 to The Road Home program at Rush University Medical Center, which helps veterans return to civilian life. For beer connoisseurs, the EHR IPA contains Equinox, Hallertau, and Rakau hops. It’s also on tap at more than a dozen bars and restaurants in Madison, so grab a glass if you can. Their open house also featured cookies from The River Bakery, which provides job training and placement in the baking industry. Everyone knows how much I love pastry, so this made me smile. That’s a great question. The short answer is that it’s hard to keep up, especially if you’re really in the trenches. I have a few key journals that I read. Unfortunately, I don’t read them regularly, but rather stack them up (I’m still a paper girl at heart), and when the pile gets so tall, then I curl up and read the articles that are pertinent to my practice and my clients. In addition to new articles and reviews, several also have “tips from other journals” sections that may lead me to read parts of other journals. I’m also a big fan of the Wolters Kluwer Health UpToDate product as far as researching the most current thinking on a given condition, especially when you have someone in front of you with a condition you may not have seen in years. In my clinical setting, I’m often working alone and don’t have a colleague I can grab between patients and bounce ideas off of them. I do have clinical decision support in my EHR that links to the literature, but I rarely use the links. With my current vendor, I trust that the physician informaticists on staff did the right thing when it was built, but I’ve seen some crazy bugs in previous systems. How do other physician readers keep up? Email me. But new research is happening all the time, are these systems equipped to update your links based on new findings? How does that work? All of the systems I’ve used over the last few years have had mechanisms for updating clinical decision support. Some are better than others though. One had individual modules that had to be updated one by one (allergies, medications, lab test orders, etc.) Others deliver the updates as part of regularly available service packs or upgrades. The best systems not only provide the updates but allow for client configurability or customization during the time between when a new recommendation is announced and when the vendor can actually deliver it.